Eggert's sunflower (Helianthus eggertii), a rare plant of the Highland Rim region of Tennessee, Alabama, and Kentucky, was removed from the federal list of endangered and threatened plants on August 18, 2005. During the eight years it was listed as a threatened species, monitoring and exploration showed evidence that populations were increasing in size and sustainability. Recovery of a federally listed species is a first for the Air Force, and conservation work at Arnold Engineering Development Center is responsible for this milestone. The base is home to the largest known occurrence of Eggert's sunflower. 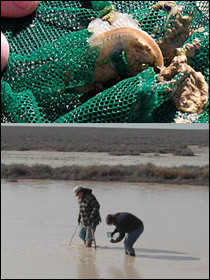 Efforts here have been of primary importance in the recovery of the species and the delisting process. Active management, research and monitoring, and cooperative agreements have contributed to the sunflower's success at Arnold AFB. Helianthus eggertii, a showy sunflower that often reaches eight feet in height, was listed as threatened by the U.S. Fish and Wildlife Service in May 1997. Only 34 sites were originally found, in Alabama, Kentucky, and Tennessee. Twenty sites were observed in Tennessee; half of these sites supported less than 20 stems each. At that time, it was believed that the plant was restricted to a few remaining natural Barrens areas, and that it was opportunistically inhabiting low-quality sites in a desperate attempt to persevere. The Barrens habitats of central Tennessee do, in fact, correlate strongly with the geographic range of Eggert's sunflower. Here, the term "Barrens" refers to the unique grass-, shrub-, and woodland complex that once characterized the Highland Rim physiographic region. The gently rolling uplands, interspersed with wet flats and depressions, appear much like the familiar Midwestern tallgrass prairiesavanna- woodland environment. Prior to European settlement, the health of these systems was dependent on fire and grazing. A history of fire suppression and agriculture, however, has drastically reduced the extent of the Barrens. 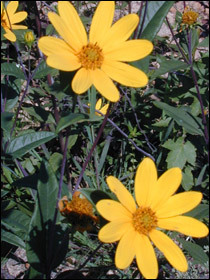 As a key member of the declining Barrens biological community, Eggert's sunflower has been a species of special concern. We have learned a great deal about the sunflower's ecology. The USFWS Recovery Plan for the flower called for the documentation and protection of at least twenty self-sustaining populations. At the time of listing, little was known about the plant's population ecology, and what genetic relationship each observed site had to other sites. Nor was it understood that the disturbed manmade sites where it was found represented not marginal, but thriving, sunflower populations. Genetic studies in 2002 and 2004 helped define what "self-sustaining" means for sunflower populations. Using that information, and exploring a wider variety of habitats, the original number of sites (34) has exploded to 287, providing home to 73 distinct genetic populations. Twenty-seven of these populations occur on public lands, or land owned by The Nature Conservancy, and are now protected by management plans. The plans were developed through the cooperative efforts of the USFWS and partnering organizations, including The Nature Conservancy, Kentucky Transportation Cabinet, Kentucky State Nature Preserves Commission, City of Nashville, Mammoth Cave National Park, Tennessee Wild - life Resources Agency, and Arnold AFB. Each cooperative management agreement provides for continued activity that maintains or expands Eggert's sunflower occurrences. Foremost among techniques for managing this sunflower, and a common element in all the management plans, is the restoration of fire as an ecological process. Arnold AFB practices an unusually aggressive prescribed burning program. 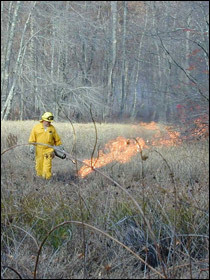 Base land managers also utilize mowing (which mimics grazing pressure), and are currently experimenting with various combinations of burning and mowing to determine the most effective method for maintaining the open Barrens environs favored by Eggert's sunflower. Additional treatments include silvicultural practices such as thinning and clearcutting, and invasive pest plant removal. Of the 27 total protected populations, Arnold AFB is home to 11. Eggert's sunflower is managed here according to several binding plan documents. In the past, the Eggert's Sunflower Management Plan and Barrens Management Plan have directed activities. In support of the delisting process, AAFB and USFWS signed a cooperative management agreement in 2004, guaranteeing continued protection and monitoring of Eggert's sunflower on the base. The agreement provides for the inclusion of sunflower management in the base's new, comprehensive Integrated Natural Resources Management Plan (INRMP). Mandated by the DoD, the INRMP is an authoritative guide for all natural resources activities on base. AAFB conservation staff are also consulting with regional USFWS staff to complete the post-delisting monitoring plan. This plan is federally required to ensure species' stability for the five years following delisting. The ongoing cooperation will address Eggert's sunflower protection and monitoring both on base and across the region. The Eggert's sunflower case is a good example of ways in which endangered species on a military installation  or anywhere, for that matter  can be found, studied, inventoried, nurtured, included in an area-wide conservation plan, protected, and, finally, moved to a more exalted status (or "delisted," as the bureaucratic term would have it). The Eggert's success story need not be an unusual example. Endangered species of all sorts, be they plants or animals, birds or aquatic creatures, can be conserved once similar attention is focused on them. In fact, it could be argued that the military installation, with its strict attention to rules and regulations and its promise to "get the job done," is the ideal place to save endangered and threatened species.